Lost a parent. Found my God. A person who believes that nothing is known or can be known of the existence or nature of God. I have been an agnostic for as long as I can remember. Coming from a family of staunch believers in divinity, I was the oddity. None of the relatives understood what I was. Honestly, I did not see sense myself. Praying was a matter of convenience, remembering a higher power happened when I was in trouble and needed an out. I stood near Papa’s head, trying to take it all in, when it hit me. A wave of sheer realisation. This will be the last I see of him. Ever. Then there was His voice in the back of my head. Because that is what he would do. Papa sang songs to commemorate events, big or small. He did that all the time. He used to say that it was his way of making a memory that lasted way longer than just a few random seconds. In that eternal moment I knew how I was going to remember him for the rest of my life. I was going to make him a part of every memory I make thereafter, big or small. From that moment on, I gained a God. Watching over me. Loving me. Letting me make mistakes. Smiling down at me while I teach mum how to pick a perfect song for every emotion. Papa was an amazing man. His sense of humour is as legendary as his anger and self-respect. No man could ever lead a family out of non-entity the way he did. He taught me how to be benevolent by just being himself. We had our share of fights as well because he raised a daughter who would not give up without making herself heard. He believed that people were essentially good and helpful. He may not have necessarily turned me into a believer but I am not a skeptic anymore, because my father is my angel. Dealing with the loss of a loved one, let alone a parent, is one of the most difficult things a person has to go through in his life. Living in denial is bad. Worse than that is trying to get over the death. You don’t get over someone dying. Instead, you learn to live with it. You embrace it and you let the happy memories of that loved one heal you. The moment when you can think of those who went away and smile at the kindling of a fond memory about them is when you know all is going to be well after all. Its been 7 days and Papa’s memory makes mum and me smile more than it makes us weak. He gives us strength to carry on. I hope there is internet connectivity and a constant supply of mangoes and pizzas where you are. I will look after mum, don’t worry. You just make sure I don’t do anything stupid, I know you will point me into the right way when need be. Needless to say, I miss you. A lot. I love you so much. May God bless you with the best of everything Ma'am. Your determination is your strength. Your strong ideals keep you going and never ever let go of them. Singing my way through life, one song at a time. 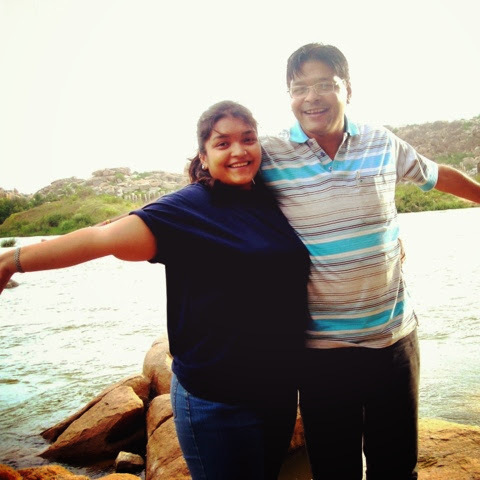 God bless u Disha…….Your papa will always be there with u n your mom. He must be watching you guys from the heaven above. So deep, brought me into tears. May your Papa always be happy, wherever he is.